RSM's Golf Blog: Team RSM – News Galore! Team RSM – News Galore! We can’t believe The Masters is already over! Wow, what a tournament – we were so impressed by all of the players and their excellent performances. And although we truly missed Johnny Paulk, golf pro and longtime announcer at the 18th hole at the Masters, we still enjoyed a great ending to the championship. Congratulations to the winner, Patrick Reed! With the Masters behind us, we’re looking forward to the RBC Heritage this week in South Carolina! Team RSM Member Davis Love III will be playing, and he is no stranger to the course. Davis won in 1987, 1991, 1992, 1998 and 2003. 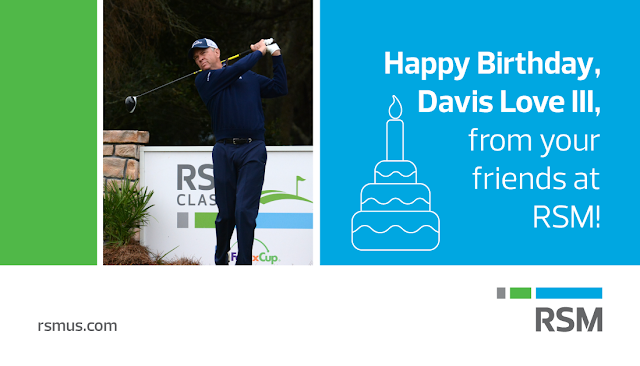 The excitement of the week will continue for Davis on Fri., April 13, which marks his birthday! We hope you have a great time celebrating in South Carolina, Davis! Davis will be joined on the course by his son and Team RSM Member Dru Love. Dru will be the third generation of the Love family to play at the RBC Heritage! In 1969 and 1970, Davis’ father and Dru’s grandfather played in the tournament. Davis and Dru both spoke with the press ahead of the tournament earlier this week. Watch a clip from the interview here! Team RSM Members Zach Johnson and Chris Kirk will also be playing, joined by past RSM Classic winners Austin Cook (2017), Mac Hughes (2016), Kevin Kisner (2015) and Robert Streb (2014)! Want more information on the RBC Heritage? We suggest reading Betfair’s recent article here. Of course, we especially love the RSM Classic tie-in and shout outs! It's a bit more open than this track, but form at the Seaside Course, Sea Island, home of the RSM Classic, formally the McGladrey Classic, is well worth considering. It's only around the corner so it makes sense that it should correlate nicely and it does. Last year's RSM Classic was won by Austin Cook, who makes his debut here this week but the places were filled with players with form here. The runner-up, J.J Spaun, was sixth here last year on debut, Brian Gay in third, won here in 2009, and Kevin Kisner in tied fourth, was beaten in the playoff here three years ago. Kisner also won the RSM Classic in 2015 when the 2013 winner of this event, Graeme McDowell, finished third. There have only been eight editions of that event but there are plenty of examples of players playing well at both events and the first three RSM Classic winners all had a top-six finish here on their CV too. It's a very similar exposed, wind-affected, seaside course so it's no surprise that form there stands up well here. In other Team RSM news, we’re delighted to welcome pro-golfer Michele Thomson to the RSM team! Michele plays on the Ladies European Tour, and 2017 was her best year yet! 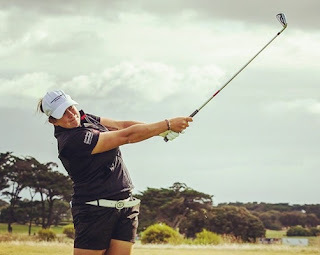 Her career highlights include finishing 16th on the Ladies European Tour’s Order of Merit and finishing 2nd place at the Hero Women’s Indian Open, both this year. Welcome to the team, Michele! As we wrap up our post, we also wanted to say a special thanks to Zach Johnson. Zach joined RSM at a fundraiser benefitting the RSM US Foundation a few weeks ago – see a related photo in the Austin Business Journal’s digital edition here: https://www.bizjournals.com/austin/digital-edition?issue_id=252625.